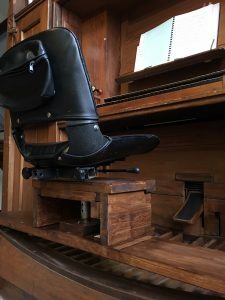 The Incredible Organ Bench Backrest! ‘Get an organ bench with a back rest!’, ordered our priest, on the realisation that my back injury meant I couldn’t play. So I tried to do just that. 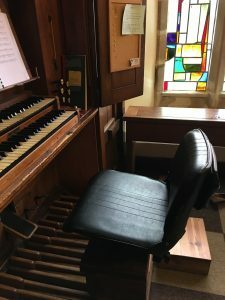 A search of the Internet didn’t produce much, while an appeal to other organists brought answers saying much the same thing: you need a joiner to make a bespoke bench. Then David, our organ builder, stepped in and came up with a really excellent device. 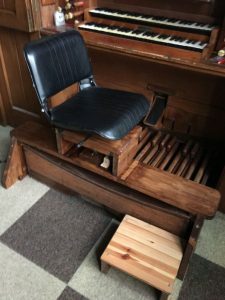 He got a padded seat from somewhere and attached it to a wooden frame spanning the pedalboard. The seat has a lever which allows it to swivel, so I can get on and off without stepping on the pedals. Two wooden steps on the right allow me to climb easily into the seat. And the whole thing is quickly removed – you just pull it backwards – so that other organists can use the real bench. Our priest was delighted and even produced a cushion of suitable thickness to give more support at the back of the seat. I have now played at two Sunday Masses and at a funeral, thus giving the whole invention a good workout. Congratulations to our imaginative organ builder. Take a bow, David! That’s an incredible achievement. What a clever man indeed! Enjoy! Thanks for your comment, Joseph. I know what this is like. See my most recent post (11 June 2018) for more information.